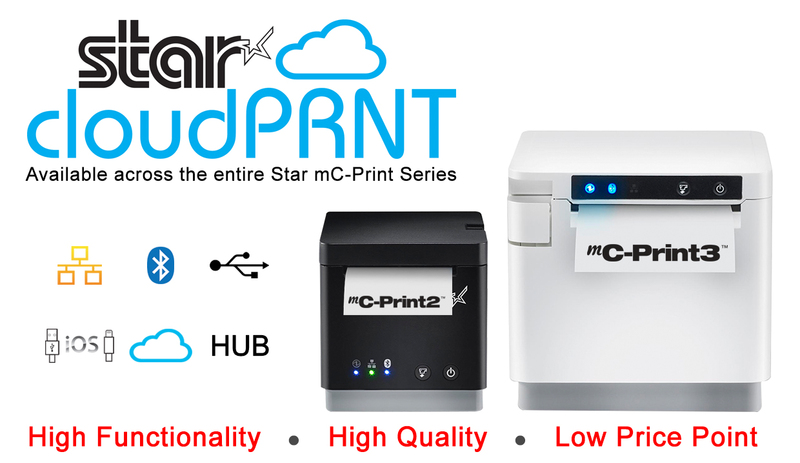 High Wycombe, UK, 1 November 2018 International POS printer manufacturer Star Micronics announces that its unique mC-Print™ series offers Star CloudPRNT™ technology for remote PC-free printing of receipts and tickets directly from a web server to Star mC-Print2 or mC-Print3 printers located anywhere in the world. Ideal for applications across retail and hospitality including Click & Collect in-store orders, event ticketing and online food ordering, etc. mC-Print offers a low cost, compact and versatile Cloud printing solution. The mC-Print series provides not only the unique functionality of 5 interfaces and multiple peripheral support but connectivity for the retailer’s transitional journey from traditional EPOS to Cloud-based tablet POS in order to meet the needs of an evolving multichannel environment. Up to now making the transition to Cloud-based tablet POS has been expensive, particularly for small to medium-sized retailers. Recognising this, Star has developed the mC-Print series featuring 58mm and 80mm print width models with a multiple POS peripheral Hub – all at a much lower cost than previously available on the market and including extra interfaces for both traditional and tablet POS. Via a single power source the Hub allows retailers to create a POS station by simply connecting a choice of scanner and customer display. The entire mC-Print series is cloud-ready including the entry-level mC-Print20 with LAN and USB interfaces. Star’s mC-Print21 LB (LAN and Bluetooth) and mC-Print3 L and LB models feature 2 USB host ports for local or cloud-based peripheral control of Star’s SCD222 customer display and / or Star’s 1D scanner or the Symbol / Zebra DS9208 2D scanner. Click & Collect in-store orders – ideal for customers ordering from a retailer’s central website and collecting goods in individual stores. Restaurant aggregation – providing constant polling for online orders. A cost-effective solution for smaller takeaways / restaurants as the one printer can act as both the receipt printer and website order printer. Seamlessly combining sophistication with high functionality, the mC-Print series aesthetically matches the sleek, modern design of tomorrow’s retail and hospitality environments to provide feature-rich, front-feed compact printers. With a print speed up to 250mm/second, the printers can feature all of the following interfaces in one model: Ethernet LAN; Bluetooth (MFi); traditional USB; lightning USB (data and charge USB for iOS) and CloudPRNT™ as well as Hub functionality for more than one peripheral; scanner, customer display, etc. Star has ensured the 58mm model is as intelligent as the 80mm model. Faced with the challenge of rising paper costs, thin paper support and choice of print width with ECO tools help users to economise on paper usage and reduce environmental impact. The aesthetic design of the mC-Print series is not only compact and stylish but also offers high functionality for a variety of environments. In particular, the soft operating switches, ‘protected’ control boards and IPX2 rating allow these printers to operate efficiently in demanding environments. And, with easy Ethernet setup / static IP address setup using the Star Utility (Native) via USB, installation costs are kept to a minimum. Incorporating Star’s Cloud Services with digital receipting and Internet device management mC-Print offers users the next generation of POS printer that boasts a wealth of onboard marketing and receipt tools for tomorrow’s multichannel world.